Oh Mariah. You silly, little 43 year old woman-child. 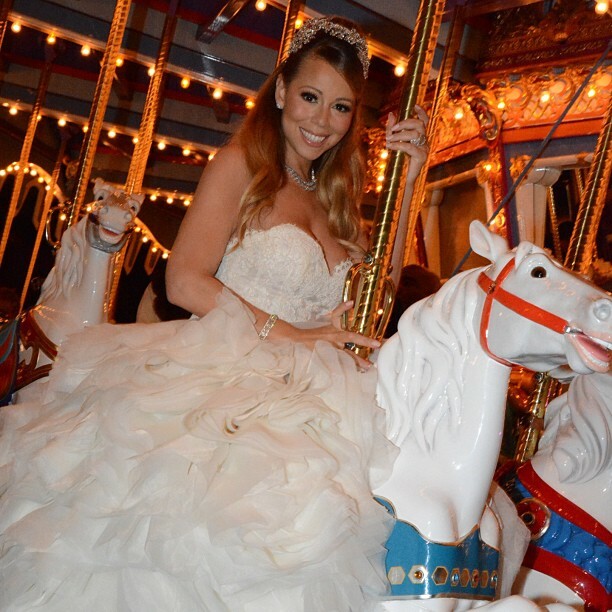 Mariah Carey and Nick Cannon just renewed their vows for their 5 year wedding anniversary in a lavish ceremony that included 250 guests and shutting down the entire Disneyland park. Oh and Mariah dressing like Cinderalla. Obvi. Because the only thing more rational than having a vow renewal with more guests than most people have at their first wedding, is doing it at an amusement park for children, in your mid 40's. You know, the world is a crazy place. You can't predict who will go crazy. You can't predict what the economy will do. Hell, you can't even predict the weather sometimes. It's nice to know in a world full of the frightening and unknown, that one thing will always remain constant: Mariah Carey being ridiculous. And Nick Cannon going along with it and dressing up as a Disney prince. Thank you for being someone I can count on Mariah. Give my love to #dembabies and the whole gang at Disney!